Netting is a standard mechanism used in banking and financial markets for the settlement and payment of competing rights or interests between counterparties. This occurs through an agreed process of termination and evaluation of such rights or interests and consolidation to one single (or ‘net’) payment from one party to another, minimising the overall credit and settlement risk. Within the UAE netting laws have been issued and have been in force in the free zones of Dubai International Financial Centre (DIFC) and Abu Dhabi Global Market (ADGM). However, outside of those financial free zones the legal basis of netting in the UAE has rested on less certain legal foundations. For example in an insolvency scenario, parties located in the UAE could rely upon the provisions of the Federal Bankruptcy Law No 9 of 2016 for the purposes of the setting-off of debts but only for those that crystallised prior to commencement of insolvency proceedings. 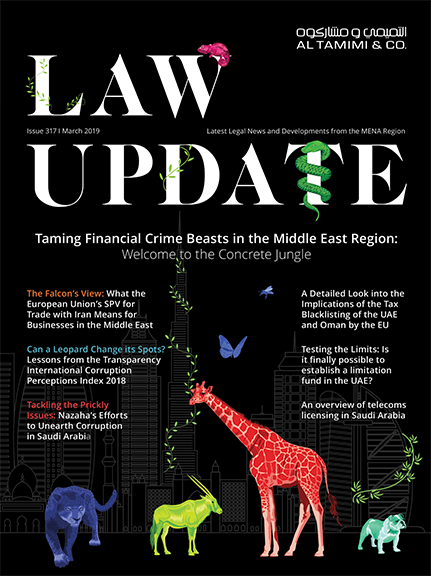 The UAE Decretal Federal Law No 10 of 2018, regarding Netting (Netting Law) was issued on 20 September 2018 regulating netting for the first time in the UAE on a standalone basis and placing the UAE between the positive netting jurisdictions of sophisticated legal systems by following the guidelines of the International Swaps and Derivatives Association (ISDA) Model Netting Act 2006. Potential conflicts with the bankruptcy law and Civil Code in the UAE are addressed in the wording of the Netting Law. Recognition of netting is also included in the Decretal Federal Law No 14 of 2018 regarding the Central Bank & Organization of Financial Institutions and Activities (the New Banking Law). Pursuant to the Netting Law, the concept of netting incudes: (i) the termination, liquidation and/or acceleration of any payment, obligation to deliver, entitlement or obligation to make receive or require payments or deliveries under a Qualified Financial Contract (as explained below) entered into under a Netting Agreement (as explained below) or to which a Netting Agreement applies; (ii) the calculation of the net balance (according to an index of a close-out or termination value or any other relevant value) in respect of such terminated, liquidated and/or accelerated obligations or entitlements; and (iii) the conversion of such estimated value into a single currency. Netting Agreements: which include, amongst others: (i) any agreement between two parties that provides for netting in connection with one or more Qualified Financial Contracts entered into in relation to a master netting agreement; (ii) any master agreement that provides for netting of two or more master netting agreements; and (iii) any collateral arrangements related to (i) and (ii). Shari’ah law contracts are expressly included in this definition. The Netting Law does not apply to financial free zones to the extent there are similar laws in place (such as those in the DIFC and ADGM). A Committee for Designation of Qualified Financial Contracts is to be formed by the Ministry of Finance and will be in charge of providing opinions on matters related to Qualified Financial Contracts and nominating or removing contracts in the list of the qualified under the law contracts. Qualified Financial Contracts will be considered final and enforceable. Furthermore, any Qualified Financial Contract shall not be void or unenforceable if such contracts are considered speculative in nature. In other words, the provisions of the Netting Law in relation to netting arrangements may override the concept of gharar (which is forbidden) in the UAE Civil Code. The Netting Law makes netting agreements final and enforceable even against an insolvent party or any person providing security in support of the insolvent party. Obligations of a party to make payments under a Netting Agreement shall not be ceased or suspended due to bankruptcy or insolvency proceedings or the appointment of a liquidator in relation to that party and any Netting Agreement will take effect in accordance with its terms. Pursuant to the New Banking Law, obligations that are netted shall be disregarded in the bankruptcy or liquidation proceedings and any netting operations or any financial transfers already paid shall not be cancelled. Any powers of a liquidator to assume or repudiate contracts, transactions, claims or obligations will not prevent the performance of obligations under a Qualified Financial Contract entered into under a Netting Agreement or to which a Netting Agreement applies. The provision of the Netting Law will not be affected by any applicable law limiting or prohibiting the exercise of the rights of set-off, offset or net out obligations or payments of any netted value between an insolvent and a non-insolvent party – thus overriding the position in the Bankruptcy Law. any transaction entered into by the insolvent party in accordance with the terms of any Netting Agreement in order to give effect to the netting provisions of this agreement. The New Banking Law further supports the enforceability of netting as it makes clear that if netting has been effected, then (a) the obligations that are netted shall be disregarded in the bankruptcy or liquidation proceedings; and (b) any net obligation that has not been discharged shall be payable. Prior to the introduction of the Netting Law, use of derivative contracts by financial institutions was commonplace. However, the UAE legal analysis underlying such agreements contained a number of qualifications which meant that the UAE could not be categorised as a jurisdiction where the enforceability of netting was certain. There had even been core precedent that found derivative-type contracts to be unenforceable. The Netting Law is a positive step in clarifying and giving certainty to the local and international markets that the fundamental aspects of netting and derivative contracts will be recognised in the UAE. It represents another welcome and dynamic step in the UAE’s rapidly maturing legal system to promote greater financial activity in the country and strengthen the country’s position as a premier global commercial and financial hub. Al Tamimi & Company’s Banking & Finance team regularly advises on derivative transactions and netting arrangements. For further information please contact Jody Glenn Waugh (j.waugh@tamimi.com), Mark Brown (m.brown@tamimi.com) or Maria Drenova (m.drenova@tamimi.com).